Why Are so Many Objects in the Universe Round? 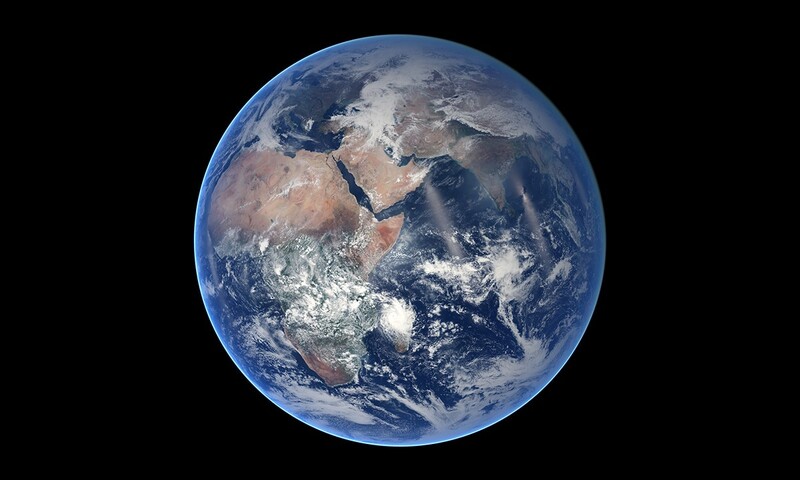 This Blue Marble picture from NASA shows just how perfect of a sphere the Earth actually is. However, because of its rotation, the Earth has a slight bulge of 26 miles (41 km) at its equator, making it an oblate spheroid. In one of the most beautiful renditions of the night sky, Vincent Van Gogh depicts the stars not as mere pinpricks of light on the supple dark backdrop of empty space, but as turbulent and lyrical circles of paint, each warm center enlaced with the husk of loving, unflinching color. However, the stars aren’t the only ones which are spherical in nature — so too is the crescent moon at the upper right corner and the brilliantly illuminated Venus just to the right of the rich and oily cypress tree. Though not visible in this painting, even the Earth in the foreground is, itself, round. It would seem objects in nature gravitate towards this round shape. Even our picture of the observable universe is round. But why? The Starry Night by Vincent Van Gogh, 1889. It has to do with some basic laws of physics. The sphere is a shape which allows for the most amount of volume with the least amount of surface. It is a very efficient way of enclosing objects and also allows for any point on its surface to be equally as far from the center as any other point. This is unlike a cube where the corners are further from its center and some areas of its surface are weaker than others. The forces of nature like low energy states and they like minimizing the surface of objects as much as possible. This is true when observing something as small as a raindrop or liquid metal or when observing something on the scale of moons and stars. Gravity is one of the biggest influences on the spherical shape of objects. With gravity, there is a center towards which all objects are getting pulled. This is why the crumbling mountain tops on Earth produce rubble that falls down and fills in the valleys and dips far below. Gravity is smoothing the planet out and, in doing so, is reducing how much energy the planet expresses. The planet wants to have the lowest energy state possible. To us here as explorers on the Earth, it appears to be anything but smooth. There’s the plummeting depths of the ocean and the underground caverns, the roiling mountain ranges and the pressing tops of trees. But if we were much bigger — if the planet could fit in the palm of our hands — we would never be able to tell. Running our fingers over the globe would feel impeccably smooth and wet. Between its tallest and deepest points (Everest and the Mariana Trench, respectively) there’s only a 13 mile (20 km) difference. A 13 mile difference on an 8,000 mile in diameter planet. But how much of a role gravity plays in the shape of an object depends on the object’s size. That’s why we may notice things around us that aren’t spherical in shape: flowers, fish, sugar cane, people. For anything smaller than around 1,600 miles (2,574 km) in diameter, gravity isn’t always influential enough to make it round. A perfect example of this is the odd and misshapen bodies of asteroids as compared to the orb of the 2,100 mile (3,380 km) in diameter moon. When we notice objects that aren’t round, it can hint at what’s taking place in that object’s environment. Common disruptions include tidal forces such as the ones exerted on our oceans by the moon, cosmic impacts, and the speed of rotation. The Milky Way Galaxy may be flat and hazy now, but it did begin as a sphere of rotating gas. As it collapsed and began to rotate faster, the centripetal forces spread the galaxy out left and right, while from top to bottom the Milky Way became papery flat. This is due to the conservation of angular momentum which encourages large objects to speed up as they get smaller in order to compensate for the reduction in size. But there are stars outside of the Milky Way structure, left as a reminder that the galaxy began as a full and cloudy sphere. 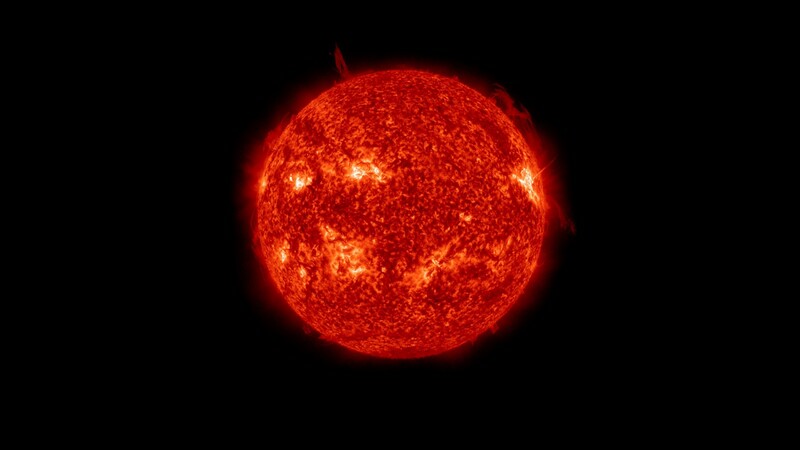 A picture of the sun taken by NASA. Our sun is even rounder than the Earth. This is thanks to its makeup of hot gasses, which are easier for gravity to manipulate than our planet’s rocky surface. But the roundest natural object in the universe is a different star named KIC 11145123. It’s twice the size of the sun and spins three times slower, allowing it to maintain its shape and not flatten out as it spins. Scientists believe this is because of a disconnect between the inner and outer layers of the star, allowing it to give the appearance that it’s spinning much faster than it actually is. The reason for the disconnect isn’t yet known but could be because of a magnetic field around the object. 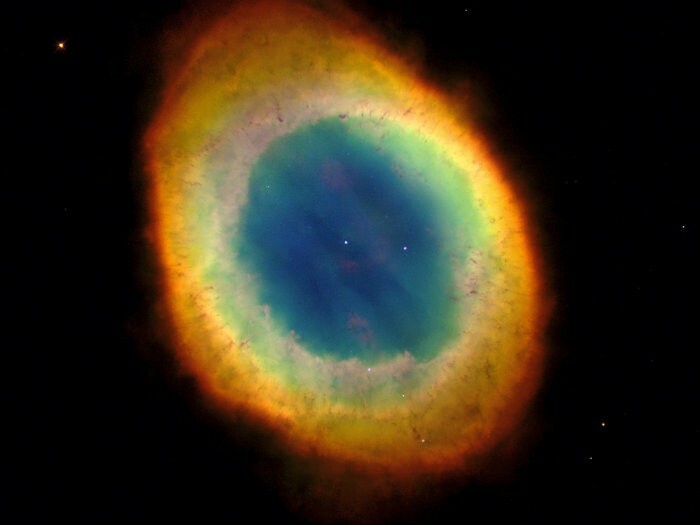 In cosmic bodies like the Ring Nebula, light pressure works against gravity, giving the nebula its distinctive shape. As stars begin to form and radiate beautifully, each one attracts gas and dust to them, creating in the space around them an ongoing competition which stretches and influences the overall nebula. But in some cases, regions of higher density can kickstart a chain event where gravitational forces begin to dominate once more. These dense areas merge and can grow to be the size of planets, giving them more of a gravitational field and producing once again the quite recognizable shape that is the sphere. The Ring Nebula. Image by AURA/STScI/NASA. We linger at the very center of the entire observable universe which expands out 13 billion light years in every direction. That is all the light that has had enough time to reach our solar system. We don’t yet have the technology to detect what lies beyond that edge but what we can see is a marble, a sphere encompassing all we know to exist. The sphere then is like the dots in a pointillism painting. At first unassuming, then coming together to form an image full of detail and life, representing at first glance just a single ball of color and yet, in fact, being a perfect example of our laws of physics in a smooth, elegant shape.